The circus company Un Loup pour l’Homme explores partner acrobatics as a language to depict a vision of humanity made up of social individuals, as different as they are dependant from each other. We consider hand-to-hand balancing as the physical confrontation of two bodies or more, in order to reveal the richness and complexity of human relations. Show in circular (2017) in which six acrobats try to keep a permanent, right off-balance state, by exploring possibilities of evolution of their movements. After almost 250 shows, in 2018, Face Nord is passed on to a team of four female acrobats. Ride & Camp is a travelling project (2019) which consists of getting in touch with partners from Central and South-Eastern Europe to create forums for dialogue and artistic initiatives. Grand-mother project, led by Alexandre since 2006, is questioning the gesture of carrying and what it means with elderly people. Workshops, cultural actions, specific projects... we intend to connect those meeting occasions with the artistic research of the company. 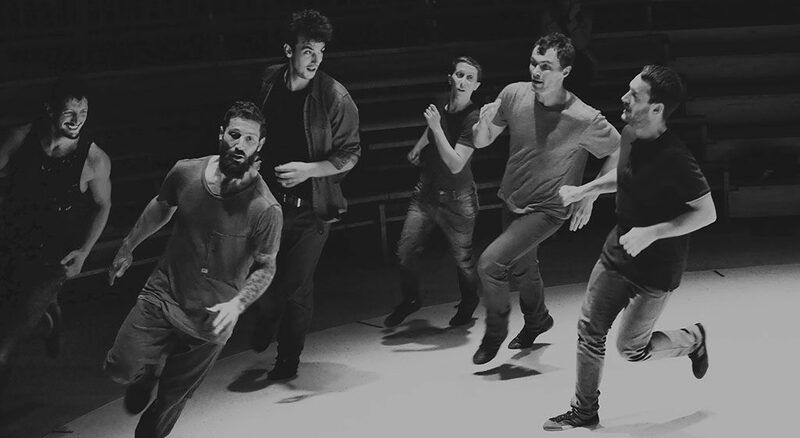 In Face Nord (2011), four men explore a script written from physical rules and games, taking the audience along with them in an experience that establishes the origins of acrobatics in the innocence of childhood games. Appris par corps, (2007 - Award 'Jeunes Talents Cirque Europe') is questioning the relationship between two people, ambiguously navigating from tenderness to violence.